Australian scientists who modeled conditions on Mars to examine how much of the Red Planet was habitable said that "large regions" could sustain life. 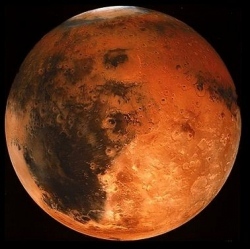 Charley Lineweaver’s team, from the Australian National University, compared models of temperature and pressure conditions on Earth with those on Mars to estimate how much of the distant planet was livable for Earth-like organisms. While just one percent of Earth’s volume — from core to upper atmosphere — was occupied by life, Lineweaver said their world-first modeling showed three percent of Mars was habitable, though most of it was underground.